Before joining Integrated Facilities Solution (IFS) in 2000, Angelo began his career at the ground level as a carpenter and then worked his way through the ranks at one of Chicago’s largest general contractors. 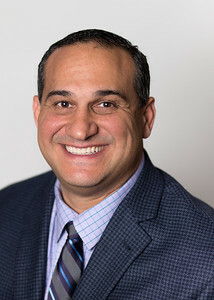 Angelo’s combined passion for design, construction and business brought him to IFS where he has been responsible for master planning and design, conceptual estimating and scheduling, day to day project management duties on several large renovation projects, and long-range capital planning. Not only has Angelo left his fingerprint on the firms largest and most complex projects but on the culture of the team by promoting engaged listening, creative problem solving and an unwavering commitment to our clients. By being an integral team member on many of our most significant projects I have the unique ability to blend first hand project knowledge with our database of historical project data. This allows me to quickly and accurately generate conceptual pricing and schedules for projects while reducing the need for our clients to invest significant planning and design dollars. Constructing a new building or renovating a department is a series of complex tasks. Numerous layers of project stakeholders, often with differing or competing needs, further complicate this process. As an advocate for our clients, I’m entrusted with the responsibility to produce a project that not only meets our clients program, budget, and schedule needs, but to produce their project in a way that meets the needs of all project stakeholders with minimal impact to their daily operations. I believe delivering on these needs simply can’t be done without getting into the weeds; taking the time to listen, fostering a team approach, leveraging years of experience and capitalizing on long standing relationships with trade partners and vendors. 75% of our projects are in fully occupied sensitive environments. This is where I really get to capitalize on my passion for design, construction and business. I encourage creative thinking, teamwork and engaged listening to provide our clients solutions that not only keep their businesses operational, but allow them to thrive during construction.